*Easy to install, you can easily install. *Die casting aluminum shell, shock proof and waterproof function. *Waterproof and anti – Corrosion: it can be used in heavy rain or harsh environment. *Wide operating voltage range: it can be applied to different types of vehicles. *Long life: advanced LED more than ordinary light bulbs, life more than 30000 hours or more. *Compatible with both 12V and 24V vehicle. *The glass surface is made of Quart Lens with high light transmission. *The suitable design for heating elimination. *The high performance of tight waterproof, dustproof, quakeproof. 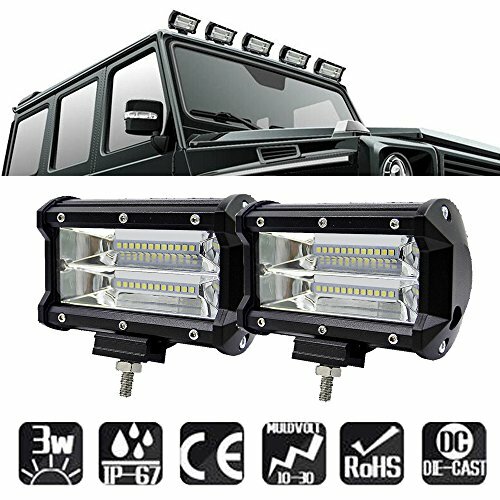 Applications Widely Support, except for off road vehicle lighting, it can also be applied to Material handling, Agricultural machinery lighting, Marine LED lighting and Emergency & rescue LED lights. Such as:Off-Road Vehicles: UTV, sand rail, buggy, ATV, SUV, truck, train, motorbike, bus, tank etc. Engineering Vehicles: excavator, road roller, bulldozer, crane, fork lift and mining truck etc. Specialized Vehicles: fire engine, police car, rescue vehicle, communication vehicle, military command vehicle etc. Others: boat, fishing, courtyard lamp, yacht, road/ street lamp, etc. Shockprooof and Waterproof :The glass surface is made of Quart Lens with high light transmission. Die casting aluminum shell ,shock proof and waterproof fumction. High power and Low energy: 72W 7200Lumens High intensity LEDs,Color temperature 6500K Diamond White give out bright and white ray for clear visibility. Perfect for most 12V and 24V vehicle, Such as:Off-Road Vehicles, SUV , Truck , Motorbike, etc.